SPY fell 3.7% this week, while my account fell 1.1% to its lowest value ever. Half of the loss is due to the fall in the price of gold+platinum, which I was sort of expecting once I heard that “21 of 22 gold traders surveyed” thought that gold would go up. If over 90% of people agree on something, that thing is probably a falsehood. Euro news: All major Euro countries are experiencing declining prices for their national-debt bonds. Investors are fleeing! US news: The bankruptcy of MF Global, and its return of only 60¢ on the dollar of customer money (that was supposed to be fully guaranteed by the futures exchange) is causing speculators to leave the futures market because it's “not safe”. Toby Connor explains why it is reasonable to expect the stock market to drop 20% in the next two weeks, because of the “daily cycle” that is now coming to a close. Hopefully I will make more money this time than I did on the October downswing (5%) or the August downswing (0%!). SCHA, TNA#1, TZA#+1: See “MACD-based swing trades” below. IAU: On Thursday, gold crashed through my stop price, but once again I didn’t set up the contingent sell order properly and so only half the shares got sold. The other half are still protected by the 5.5% trailing stop (now up to -3.3%). This decline in the price of gold suggests that the upcoming correction will be a biggie. 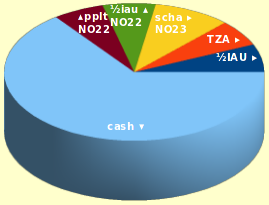 Pie chart: Because of the tilted 3-D viewpoint, the ½iau that I sold looks like a much larger pie-slice than the ½IAU that I still have; actually, they represent the same amount of money. SCHA: Weekly trade cancelled early, since it seems that a crash began on Thursday. It turns out that the weekly swing-trading system doesn’t work all that well. Over the last five years it would have had 2 gains and 4 losses. It needs more work. TNA#1: Hourly swing trade. Another loss. TNA#2: Skipped this hourly trade, avoiding yet another loss. TZA#+1: Initially skipped this hourly trade, but hopped on the bandwagon a day later. So far, so good! New rule: I have now formalized my rule for when to add more capital to an hourly swing trade. TNA: Buy more if IWM’s PPO-histogram falls by at least 0.01 for two consecutive hours, then rises by at least 0.01 during each of the following two hours. TZA: Buy more if IWM’s PPO-histogram rises by at least 0.07 for two consecutive hours, then falls by at least 0.07 during each of the following two hours. This rule increases profits drastically! For the August crash (JL 25-AU 15), this rule would have increased my account value by 10.6%. The previous rule without the buy-more clause would have yielded only 3.8%; I actually ended up keeping none of the August profits. For the October dip (SE 28-OC 07), the new rule wouldn’t have worked so well: -1.4% for the new system, -0.2% for the old. Over the last year, the new rule would have generated about 27% total gains, while the old rule would have yielded only 10% total gains. Looks great! Now “all” I have to do is implement the trades.